Hey Friends! This is Emily from Hey Friend Design Shop. 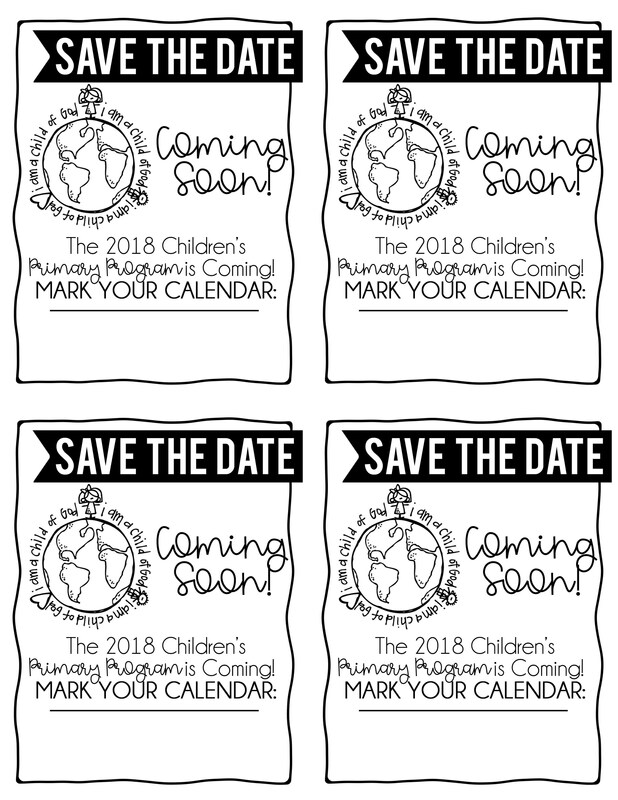 This month I’m stopping by to share my 2018 Primary Program Printables! I’m soooo excited about these and can’t wait to see how many of you put them to use. I serve in the Primary Presidency in my ward, and the Primary Program is currently the focus of our attention. I’ve loved the theme in Sharing time this year, “I am a Child of God”, and knew I could design a Program Cover to really incorporate that each child is Unique and a Child of God. There are FOUR Parts to this Download. -I’ve included some helps for customizing these files at the end of the post. -The fonts needed to customize are free, and are commonly used fonts here at Little LDS Ideas. Next up, the 2018 Primary Program Sacrament Meeting Cover. I LOVE how these turned out! Again, I kept it simple and easy to copy- Black & White. There are six different covers in the PDF file- three boys and three girls. The covers can be copied on white paper at the church. My ward plans to copy our entire Program (inside outline and these cute covers on the outside) the week BEFORE our program. We will have the Primary children color the covers with crayons to look like them. I love the simplicity of the covers and can’t wait to see the reaction of the parents as they are handed out the day of the Primary Program! Download: SACRAMENT MEETING PROGRAM COVER. Use the Photo above as a Sample for Font Type, Size, and Wording to help you customize your Invitation. The third part, and probably most important is the Primary Program Invitation. I kept with the same simple design using Black & White. However, these will take a bit more customization on your part. Don’t worry though, Sheena has some great tutorials to help out! (Shared below.) I’ve included a photo ABOVE with Font Type, Size, and the Text to add. Once you’ve got it done and ready to print- it will print awesome on white paper with simple crayon coloring, or bright colored paper or even cardstock, with four Invites per page. I’m excited to share these with our Primary Children and plan to send them with several each to invite Grandparents, Friends, and hopefully a few less active friends as well. And last, Sheena has had lots of requests for Program Comment Cards. These can be printed on simple white paper (4 per page), and left on the benches or handed out. The goal is that the Ward Members leave positive feedback for the sweet Primary Children, which can be shared following the Program. I’ve not tried doing this yet, but I am excited to use them with this year’s program. I included two different downloads below…. The first has the words “Comment Card” and the second download doesn’t- so it could be used for Primary Parts or Thank-Yous for those who have helped. Sheena has some great tutorials to help you to customize your printables. Click HERE (Microsoft Word), HERE (using Canva) , and HERE (on a Mac)! Need more help, I’m here to help! I’m glad to help customize these for you if that is something you’d like. Below is a link to listing in my “Hey Friend Etsy Shop” and I can help get these done for you. I’ve also included a FULL COLOR Version in my Etsy Shop of all the Black & White Printables I’ve shared today. Check it out and see how cute they are as well! Thanks for stopping by today! My 2018 Primary Program Printables was a BIG project, and I’m over-the-moon thrilled to share it with you! I’d really love to hear how you used them or any comments you might have. Thanks friends! Thank you for sharing these beautiful program helps. I am having difficulty downloading the program invitations. When I click on the link, it brings up the picture of the invites, but doesn’t allow me to download them. When I clicked on the comment card link, it worked and let me download. Could you please advise me on what I need to do? Is the link working? Thank you again, so much for making this available to all of us! Hi Sarah! Thanks for your comment. This printable share was a bit tricky, due the customization part. So, I shared the Program Covers & Save the Date Cards as PDF files- they come up and are ready to print as is. The Save the Date Cards & Invitations are shared as a JPEG file. So, when you click the Download here link- it does pop up as just a photo. Right click once it’s popped up, and find the “Save Image As” option. This will save it to your computer as a JPEG, ie- picture file. Then you can use one of the Tutorials at the end of the post to walk you through how to customize. Hope that helps! Let me know if you still need some help. Thanks for stopping by! These are awesome!! I can’t wait to use them for our program. The kids will love coloring them. The primary program cover pdf does not include the boy with the suit. There is a blank page instead of the 6th child. Is this intentional or was it missed? Thanks again!! You are AMAZING!! Hi Sharon! I’m not sure why the boy with the suit doesn’t show up for you. I double checked the file, and he shows up. Maybe try downloading it again. If that doesn’t work- leave your e-mail, I’d be glad to send that pdf sheet your way. Glad to hear you are using these in your ward. They were fun to design and see how so many wards are using them. Hey Sharon- I just emailed you the sheet that you are missing. Best of Luck on your Primary Program! Thank you so much for sharing your talent! Is there any way to edit the invites so that I can print them as a 4×6 print, instead of 4 on a sheet? Thank you! These are absolutely adorable! Just wanted to stop by and give a big thank you for sharing your talents with us! You are awesome! You are so welcome Shay! Best of Luck on your Primary Program! Thank you so much for these! they are super cute. I cant seem to download the invitation file though. am i doing something wrong??? Hi Hannah, The Invite file won’t download like the Program Cover, or Comment Cards. It’s a different type of file, so you can customize it. When you click the link, an image of the Invite shows up, you can RIGHT CLICK and then SAVE AS… It will be a JPEG file you need to add text to. At the bottom of the post, I shared a link where Sheena walks you through how to add text to a JPEG. Hope that helps! Oh my goodness! I absolutely LOVE these! We are for sure using them! Thank you for all your hard work!!! Where do I find the fonts to customize them??? Hi Haley! There are links to the two fonts you’ll need, Bebas & Champange & Limousines. Look in this post right about the “Save the Date” Card photo, you’ll see them. Or you can find them on dafont.com for free. Best of Luck on your Program! I love these so much! What is the name of the cursive-type font that you use? Hi Jera! It is a darling font! It’s called “agnapsfixeverything”- it’s a font I purchased and I find myself using often! 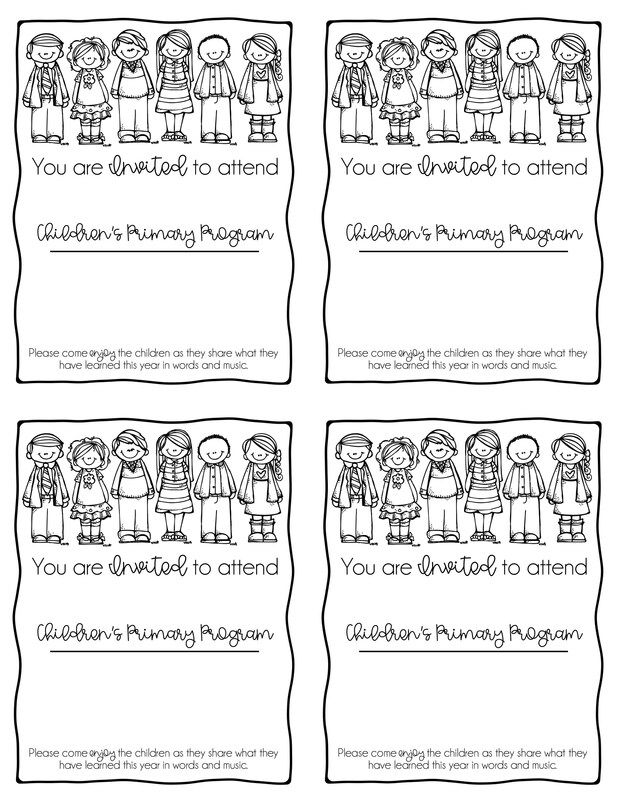 Thank you for sharing these printable!!! They are so helpful and cute!!! Thank you for offering such a cute option for the Primary Program. I am having the MOST difficult time opening the files you have as PDF. I re read through all of your comments and even went back to the Presidency facebook page to look for tips. I regularly download files, and even have used Adobe quite often, but I am not able to get these 2 files? What are your suggestions? Hi Diane. There are four files shared in this post. Two of the files are PDF Files that download to your computer. The other two files (Invitation & Save the Date Cards) are a bit different- they are a JPEG File. When you click the download link- it opens and shows like a photo would of the image- you can then “Save As” and save it to your computer. Those two files need a bit more customization. Hopefully those tips will help.